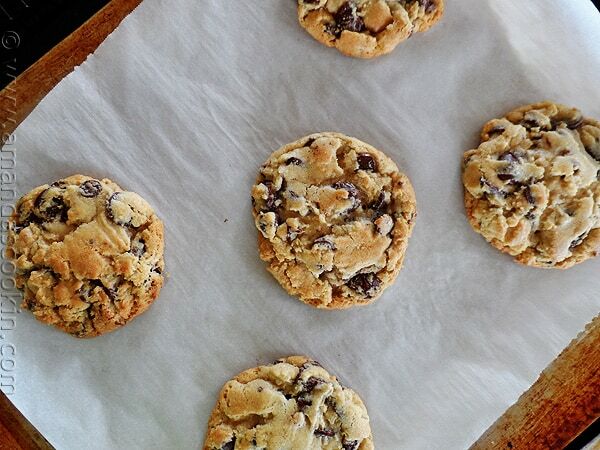 These big soft chocolate chip cookies are my favorite. It took me a few tries to get the right baking time, but I finally have them perfected and my chocolate chip loving family is quite grateful! 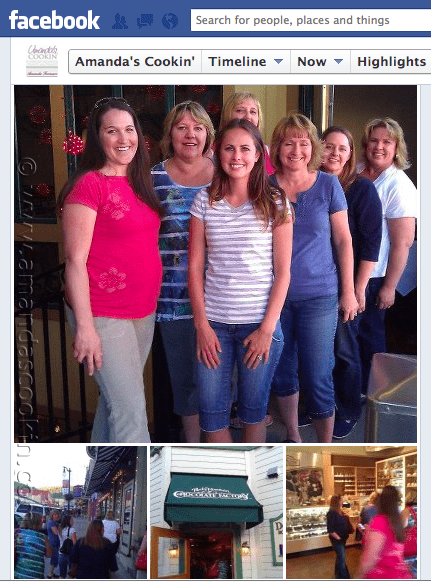 In July of 2012 I attended Evo Conference (Evolution of Women in Social Media) in Park City, Utah. You can see the photo album I posted on Facebook here. I arrived on Wednesday afternoon right around the same time as Megan of Megan’s Cookin’. Barbara of Barbara’s Bakes picked up both Megan and I from the airport and we went out for a bite to eat. Afterward we checked in to our room which we would be sharing along with Debra of Taste & Tell, Carrian of Sweet Basil, and Sandra of Everyday Southwest. The conference was Thursday, Friday and Saturday, but my flight wasn’t leaving until around 2:00 PM on Sunday, so Katrina of Baking and Boys invited me to stay the night at her home. How could I say no? I ADORE Katrina and have heard so much about her family that I knew it would be a great time, albeit too short. I couldn’t have been more right. 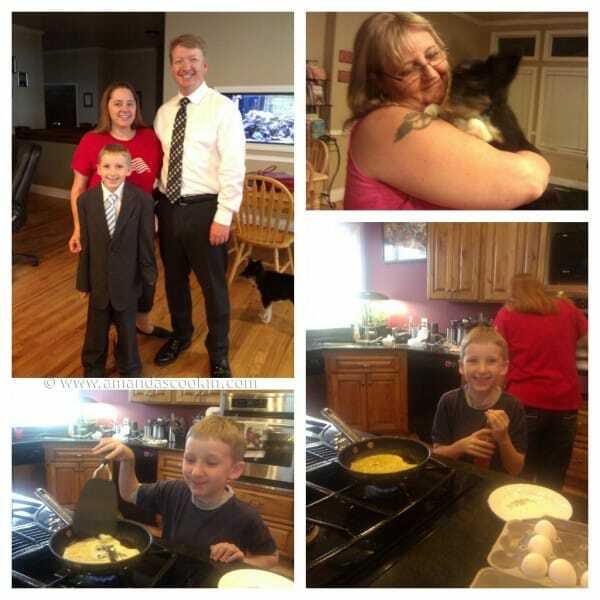 I felt so welcome in Katrina’s home, her husband Kevin was wonderful as were her adorable four boys. Pictured above is Taylor making his own eggs for breakfast. Cool kid! It was such a blast hanging out with Katrina, I only wish we had had more time! and we talked about the available light in her fabulous kitchen. We played around with a few camera angles and took some pictures of her cookies. 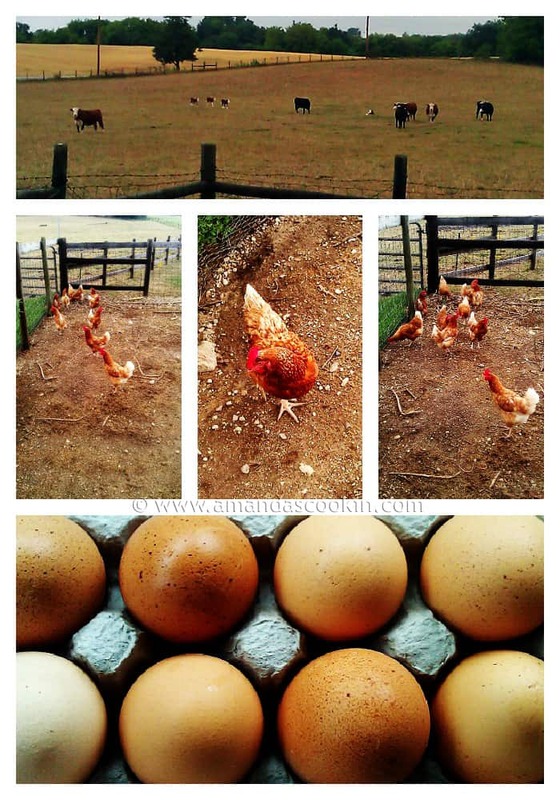 Of course I was out of eggs when I wanted to make some, so I headed over to the neighbor’s to get some. I live within the village city limits so I can’t have chickens of my own, so I drive a mile away to see these lovely ladies. I’ve made these three times. The first two times I had bread flour, this last time I didn’t. I used regular all purpose flour in place of bread flour but stuck with the cake flour portion of the recipe. I didn’t notice any difference, so I think it was a safe substitution, and less of a hassle since I don’t keep bread flour here all the time. I also cut down the amount of chocolate chips. My husband really liked the cookies but asked for me to use less chocolate. I cut them back from 20 ounces (2 bags) down to 15 ounces (1.5 bags) and to be honest, no one noticed the difference. Katrina also shared a really nifty tip with me and gave me permission to share it with all of you. 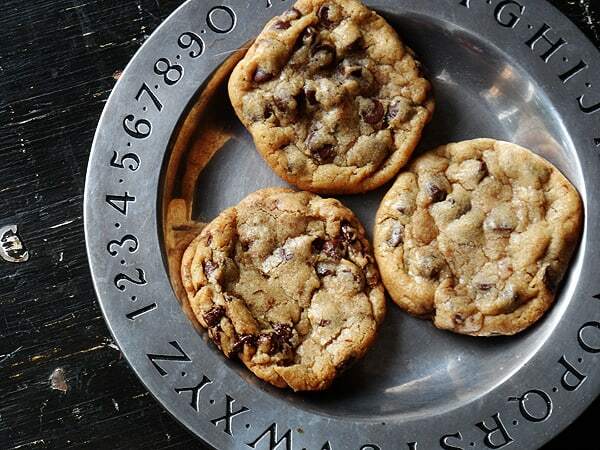 Her friends and family always ask her how she gets her cookies to be so perfectly round. 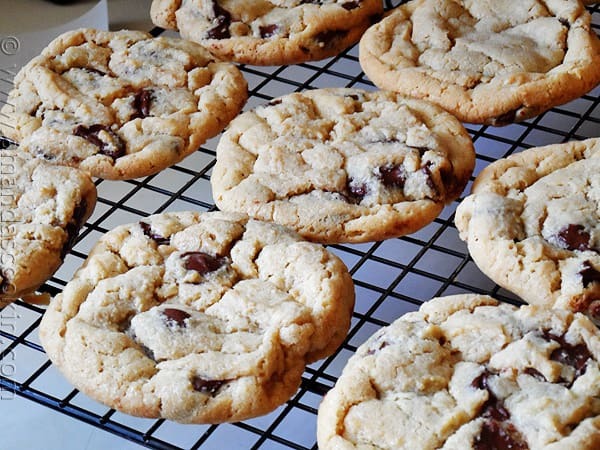 When you remove the cookie sheet from the oven, shape the cookies using the spatula, gently tapping the edges, working your way around to shape the cookie. It has to be done right away while the cookies are hot, before they begin to cool and set up. 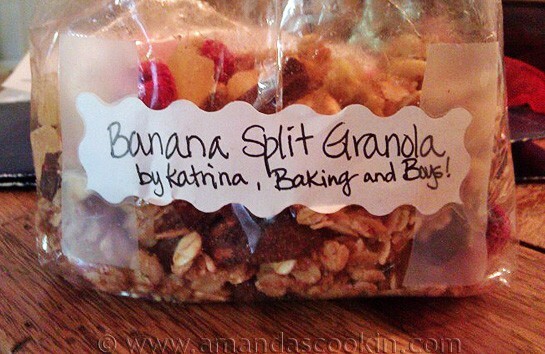 To top off my visit, Katrina had given me a bag of her Banana Split Granola which is out of this world. I saved it for the plane ride, and finished the rest off at home. Thank you for opening your home to me Katrina. I consider you a dear friend and can’t wait until the day I’ll be able to see you in person again! 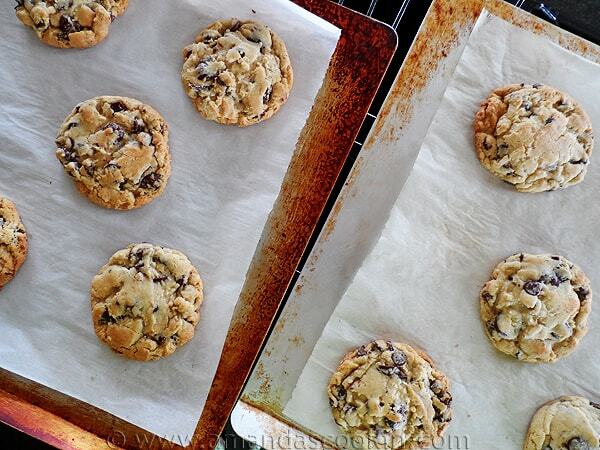 These jumbo sized chocolate chip cookies are a family favorite around here. When ready to bake, preheat oven to 350 degrees. 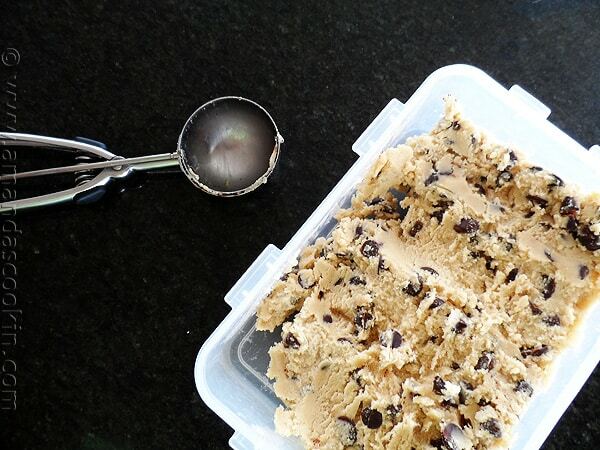 Line insulated baking sheets with parchment paper and scoop dough into balls using an ice cream scoop onto sheet. 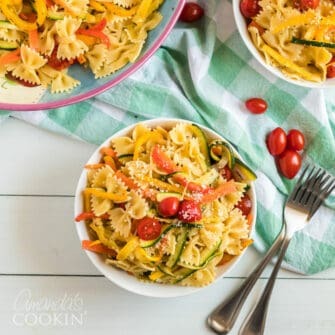 Bake 14-19 minutes. 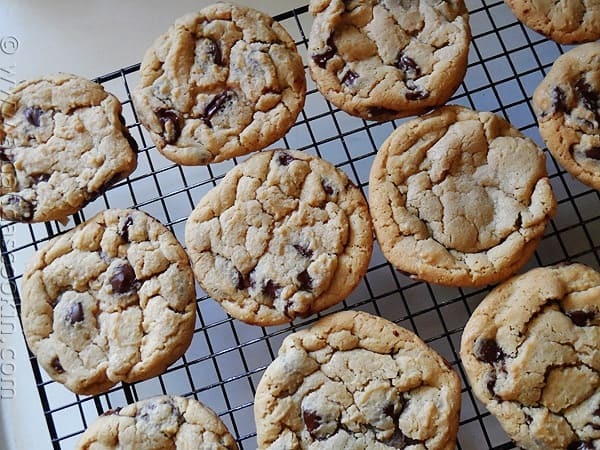 Hello – as I went to make your cookies, I noticed that both the cake flour & regular flour measurements both say 8.5oz, but underneath, the cake flour calls for 2 1/4 cups & the regular flour calls for 2 cups. just want to make sure that I’m doing it correctly, since they call for the same amount of both types of flour in ounces, but different amounts when measured in cups. Thank you! Really excited to try these! Hi Rachel! 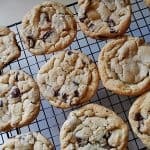 I always weigh my flour for this recipe. After weighing it I measured the weighed flour out and those were the measurements I came to. If you are able to weigh it that would be better!